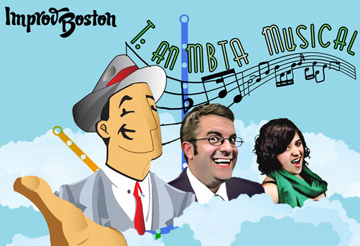 Take A Ride on "T: An MBTA Musical"
From June 30 - July 9, ImprovBoston tackles the trials and tribulations of taking Boston's favorite public transportation with the musical comedy, "T: An MBTA Musical." Directed by Jeffrey Mosser, with music and lyrics by Melissa Carubia and a book by John M. Manship, the production marks ImprovBoston's fourth annual scripted summer musical. ImprovBoston is located at 40 Prospect Street at Central Square in Cambridge. "T: An MBTA Musical" chronicles the journey of three 20-somethings whose lives have been derailed by the MBTA's shortcomings. When they discover a secret map that will enable them to conquer the evils of the T, they set forth on a colorful journey that's part love story, part melodrama and part scavenger hunt -- all in one big transportation nightmare. The score includes such lovely moments as "The Shuttle Bus Song (We Can't Handle It)" and "The Bro Song." The world premiere cast features Emily Hecht, Timothy Hoover, Brett Johnson, Emily Laverdiere, Alex LeBaron, Heather Lobe, Josh Michel, Brendan Mulhern, Ray O'Hare, Patrick Parhiala, Katie Preisig, Brandon Rahhal, Eric Rehm, Deana Tolliver, Sarah Tupper, and Lynn Wilcott. Jeffrey Mosser commented, "This is my first professional venture with ImprovBoston, and I'm so proud of the work we're doing. I get to work with some of the funniest people in Boston -- including our playwright and librettist John Michael Manship and Melissa Carubia respectively. If you've ever taken the T, you need to see this collaboratively hilarious show!" ImprovBoston's Artistic Director Will Luera added, "I am thrilled to welcome Jeffrey Mosser to ImprovBoston. Many people don't know that in addition to world-class improv, stand-up and sketch comedy, ImprovBoston has produced dozens of original scripted musicals. As a veteran theater director, Jeff brings boundless expertise and enthusiasm to this project. We are delighted have him on board." Composer and librettist Melissa Carubia holds a Masters in Composition from the Longy School of Music, where she was the recipient of the Creativity Foundation award and the winner of the annual Orchestral Composition Contest. She has worked with the Zeitgeist Stage Company as musical director, with ImprovBoston of Cambridge as a cast member and musician, and with the Fresh Pond Ballet of Cambridge as dancer and composer. She also plays keyboard and sings in various bands around Boston. Book writer John Michael Manship is an experienced playwright who has completed more than one hundred functional theater pieces including more than a dozen short plays, five full-length pieces and a multitude of sketches and shorts, which have debuted with various ensembles throughout the Boston area. "MOSAIC," the show which he co-created, runs regularly at ImprovBoston. In 2006, it was listed first by The Boston Globe in its article "Five Productions That Make a Strong Argument for Why Smaller is Better." Director Jeffrey Mosser's local directing credits include "Moving" (Company One's Fringe Wars), "Unspoken" (Universal Theatre Festival), and "Dearly Beloved" (CoLab Theatre). He is a former Education Fellow at Actors Theatre of Louisville where he co-created and directed "Theatre for Two: The Wedding Party," a site-specific piece inspecting the actor/audience relationship. Recently his play, "Love, Death, and Latex," was accepted to the Source Festival in D.C. He is a member of the Rebels Without Applause improv troupe and was a Senior Strategist for the Plays for Presidents Festival 2012.